My love of the fish taco continues. If you recall from Week 4 I have an intense love affair with fish tacos (and I may have found the most delicious at-home recipe out there that week). Fish tacos may be close to the best food ever. If the idea of a fish taco weirds you out, I get it… I was one of the unenlightened my self at one time. My first introduction to the fish taco was at Wahoo’s Fish Taco in Denver. By first introduction, I mean I was introduced to the fact that they existed, not to the fact that they were delicious. 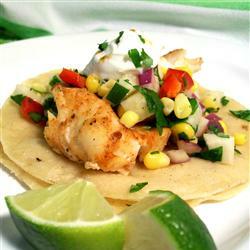 The idea of fish… in a taco… did not sound appetizing at all. I think I probably got the chicken every time I went there. When I actually got up the nerve to try one it was over for me. My taste buds had met their true love. I have found, however, that not all fish tacos are created equally. You can have a pretty bad fish taco which would probably taint your view for life. I’ve found I’ve become pretty picky about my fish tacos and will only order them if they have the following criteria: 1.) Great Seasoning 2.) Great Salsa 3.) Potatoes (a huge plus and guaranteed delicious, but not required because most restaurants have not figured out how yummy this really is). Will you give me a minute to make my case for the potatoes? I spent my final semester of college in London, England. The English are not known for their culinary skills. When I arrived, I had thought that this was just a fun European joke, but no, it’s true. The English do not make good food. Very bland. Not delightful at all. However, the one thing the English have figured out and probably the only thing they are known for food wise: Fish and Chips. The English have found the perfect complement to fish is the potato. For that we must give them credit. When I tell you that potatoes in a fish taco are marvelous, you must believe me. I don’t know what it is, but heaven opens up when you add the potatoes. I had no idea what a Jicama was. Wikipedia informed me that it is a root with a crisp texture and a sweet flavor that resembles an apple (this is a major paraphrase). I decided to substitute a whole granny smith apple in place of the jicama. IT WAS DELICIOUS!!!! For the salsa you must make this substitution and not leave it out. The salsa would have been terribly bland had it not had the tart/sweet flavor of the apple. I had accidentally eaten all the corn we had prior to making the salsa so I can’t comment on how corn goes with the salsa… the salsa was super good without it though. If you happen to click on the original recipe, you’ll find I halved the spices for the fish for the recipe posted here. A caution for the fish spices: it’s very spicy. Fiery is an accurate description for these tacos. I didn’t even use all of the spice mixture and my fish had a major kick. Again, I can’t stress enough how yummy the grilled potatoes make these tacos. What I love about this recipe is that it’s quick. It does take a while to chop everything, but there is no marinating involved with this recipe and you don’t have to plan ahead. The only major low point is the fish seasoning is too strong for Ava. I had figured this out ahead of time so she got her own little fish fillet with a different seasoning. Jeff and I raved about these tacos all night. A definite winner in our book!!!! Instead of being strict about your calorie count all the time, instead try aggressively reducing your calorie intake for two days, moderatly reduce for three days and splurge on the weekends. You’ll be more likely to stick with your plan if you give yourself some slack and you’ll keep your body guessing as to the amount of calories it will get. This helps deter your body from storing up “emergency fat reserves”. That’s my abridged version of what she said anyway. When Jillian speaks, I listen. I share all this with you because this weeks recipe definitely falls under the “Splurge” category and I just wanted you to feel good about it. I keep telling myself this so I’ll feel good about it too. Drain pasta. Serve sauce over noodles or toss noodles into the sauce. I don’t know if this is so much of a tip or a general confession, but in making this dish, I realized that I had never in my life before this cooked shrimp. The bag said to cook until no longer translucent, but to me the shrimps looked translucent the whole time. They did end up turning a little pink which I assumed ment they were done. However it was a bit comical I’m sure with both Jeff and I standing over the stove wondering how you could tell if the shrimp were fully cooked. As delicious as fresh basil and thyme would have been, I only had dry seasonings of both. I read somewhere that if you use dry ingredients instead of fresh, you should half the amount. So I used approximately 1/2 tbs of each. The original recipe called for scallops. When I was at the store purchasing my items, scallops were a whopping $10 for 1 lb! That was too rich for my blood so I opted for the $3 package of imitation crab. Perhaps that’s a seafood faux pas? I don’t know. I thought it came out ok, however I can’t say I really tasted the crab all that much. I may have wasted $3. Comments welcome. With 2 cups of heavy whipping cream there was no doubt that this dish would turn out delicious! I finally made my first cajun meal. It’s a fairly straight forward recipe and easy to make. I spent a lot of time constantly stirring my cream… I didn’t want it to scald! I have no idea how many calories and/or fat is contained in this dish, but I’m guessing it’s high. One tablespoon of heavy whipping cream has 17% of your recommend daily fat. Yep, 1 tbs=17%. I used 2 cups PLUS cheese! Jillian did say that was ok, however I can’t with good faith say I have scrimped on my calories at all this last week, so I don’t really think that it counts. All in all, while delicious, I think this one will only be pulled out for super special occasions in the future! We’re really trying for healthy here and Cajun Seafood Pasta doesn’t really fall into that category! Oh well, a little splurge every once in a while never killed anyone. I pretty much detest iceberg lettuce and wasn’t about to purchase a whole head of it just to use what would end up being just a small amount. My rational was that iceberg lettuce usually has a nice crunch and that was probably what the chef was going for… crunch. It couldn’t be flavor because, really, iceberg lettuce has no flavor. So I decided to substitute cucumber for the lettuce and was very pleased with the result. I suggest you do the same! I can’t say I’m a huge fan of anchovies, nor can I say I dislike them… I really don’t know much about them. However, I did not purchase any for this recipe and as such, they were left out. I didn’t find that the absence of anchovies was a joy-killer. On the other hand, I may not know what I was missing… your call. As with most sauces, this one made more than what was needed for the amount of fish, unless, of course, you love to drown you food in sauce. Then it would have been enough. It wasn’t a terrible amount, but after all the fish was gone, sauce still remained. I think that left over sauce is on it’s way to become one of my new pet peeves. I didn’t fry the fish, we grilled the fillets… Jeff grilled the fillets. I still haven’t learned how to use the grill. Anyway, grilling is always better I think. Sprinkle with lemon juice and you can’t go wrong. These ended up being really easy to make and surprisingly good. I had hidden doubts about the recipe this week, but we ended up really enjoying them. Everyone always needs another fish recipe! I felt good about getting more fish into my diet! Well, I still can’t say I get terribly excited about fish. While fish is high in protein and low in carbs, I usually come away from the meal feeling like I needed to have a little something more… to use my newly acquired New Orleans term, a little lagniappe. Fish and salad don’t quite cut it for me. I end up having to eat a bowl of cereal before I go to bed. I’d have to say this wasn’t the most exciting meal I’ve made thus far. However, everyone at the dinner table had a mostly enjoyable experience and the Tilapia Pitas made for a nice summary meal. We’ll probably have them again in the future. We need to keep up with our fish intake. Since moving to New Orleans, Jeff and I have been on a quest to find the perfect fish taco recipe. Prior to moving, we would go to La Luz Mexican Grill in Fort Collins which had the BEST fish tacos EVER. I’m fairly certain when I get to heaven, the good Lord himself will greet me with a La Luz Fish Potato Burrito in both hands and an endless supply will be readily available to me for the rest of eternity. To me, that burrito is like a little piece of heaven on earth. I’m salivating now just thinking about it. Nothing compares and I have yet to replicate the fantastic flavors of the La Luz burrito. But that has not deterred me from trying. What has deterred me is one too many attempts while pregnant; so we have not made fish tacos for probably a year. Jeff has been asking for them for months so I decided I’d better try a new recipe as the one we had been working on makes me nauseous any time I think about it. Again, I found this recipe on allrecipes.com; you can view it by clicking HERE. First off – you need to buy 6 limes to make this recipe. Come to find out, I could squeeze 1 tbs of juice from one lime and get 1 tsp of zest from it’s peel. I had only bought 3 limes (which was not enough) and had to make due with bottled lemon juice and no fresh lime for the tacos. To get the most juice out of the lime, press and roll it around on the counter until it softens. Its much easier to squeeze the juice that way. I had no idea what Adobo sauce was. I found a little 7 oz can in the Mexican isle of the grocery store that was called “Chipotle Peppers with Adobo Sauce”. So I bought it. That’s exactly what you need. Inside are about 3 or 4 large peppers (discard the peppers) and the rest is sauce which conveniently measures out to 1/2 cup. And just an FYI, the sauce comes out pretty spicy, so if you don’t like spicy – cut back on the Adobo sauce. Our BBQ grill had run out of propane so we didn’t grill our fish. Instead I cooked it with the marinade in a frying pan over medium high heat. Heat up your pan then just pour everything in. When the fish is cooked, it will flake apart. Most of the marinade cooks off; I transferred the fish to a serving bowl, draining off any excess marinade that was left. I didn’t use cabbage from a cabbage head. I had some cole slaw mix in the refrigerator that I used instead. You don’t use that much cabbage anyway and the pre-cut stuff is much easier. The marinade for the fish is EXCELLENT. It definitely had that Baja Mexican flavor and reminded me of fish tacos we had once in Mexico. So good. I had only fried up one potato which wasn’t enough for our whole meal. So I had one taco with fried potatoes and one with out. The potato adds a lot of yummy-ness so I highly recommend adding it to yours too! While it’s a long recipe, the marinade and the dressing were both really easy to make. I loved all the fresh lime. That being said…. Zesting limes is a pain in the you-know-what. And having to zest four limes is even more of a pain in the you-know-what. Sometimes I put orange peel in the food processor and grind it up really fine when a recipe calls for orange zest. Maybe that would work here too. I’ve never peeled a lime though and don’t know how difficult that would be. Plus, that just makes for more dishes. Anyway, zesting the limes was definitely a low point. The sauce recipe makes about 3 times more sauce than what you need for 1 lb of fish. You could probably half the recipe and be fine. You have to plan out your prep for this recipe. Since the fish has to marinade for at least 6 hours, you’ll have to get the fish ready in the morning or the night before. Not a great recipe if you’re in a hurry. All in all, we really liked these fish tacos. No match to the La Luz Fish Potato Burrito, but still good… an acceptable alternative if I can’t have the real thing! I give the recipe 4 stars because it was really tasty, but the zesting… I’m coming to really loath zesting. I continue to look forward to my eternity’s supply of La Luz Fish Potato Burritos.